This SALE ends on Monday January 16th, 2012 both online and in our shop. 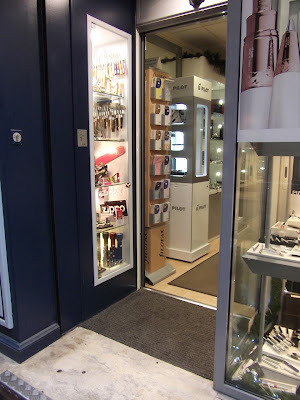 The online code is newyear (all one word and all in lowercase)..
All our SALE prices are matched in our shop at 40 Bow Lane, London, EC4M 9DT - if you'd like to use the extra discount code in the shop then please tell us at the counter before you make your purchase. The final web finds of 2011. What a year it's been. Thank you for all the blog posts you have posted and we have found... I hope we have brought you more readers to your blogs and you are building your readership and following. Let us look forward to some more great posts in 2012. Your blog post could appear here... Please email us if we missed you this week. 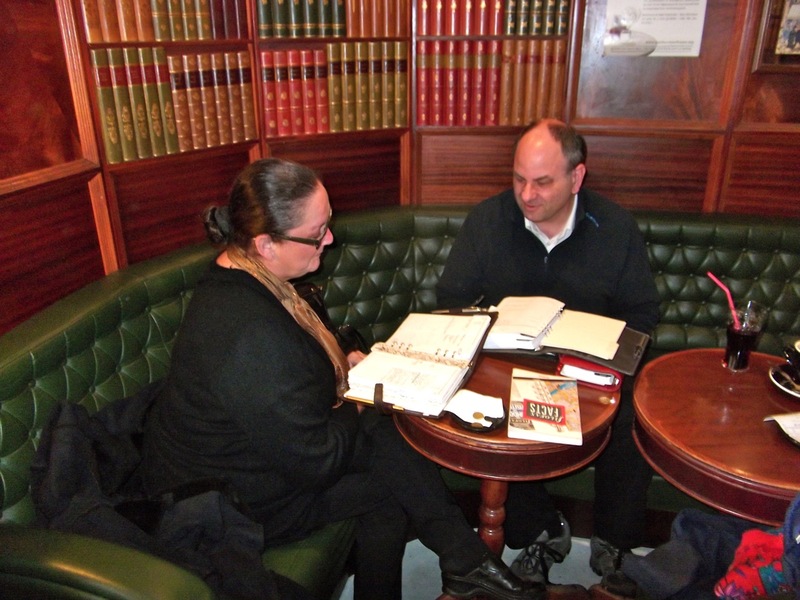 "There's a few shocks in the list of Filofax 2012 organiser retirements; Osterley Brown & Songbird stand out to me but it's also going to be goodbye from the Chameleon, Regency, Enigma (nobody got that one in any sense of the word) and some colour retirements in Malden, Domino & Apex. Some exciting new lines arriving in March and, as the legendary singer James Taylor says, every time you make a new friend you need to say goodbye to an old one - or else you get friend build-up..."
Since it's our last FFAF of the year, it's a good time to talk about our New Year celebrations. In my case, a walking tour of my town's concerts and other festivities, dinner at a favorite restaurant, and then some champagne at home. And since it is Friday, all other topics are also welcome! 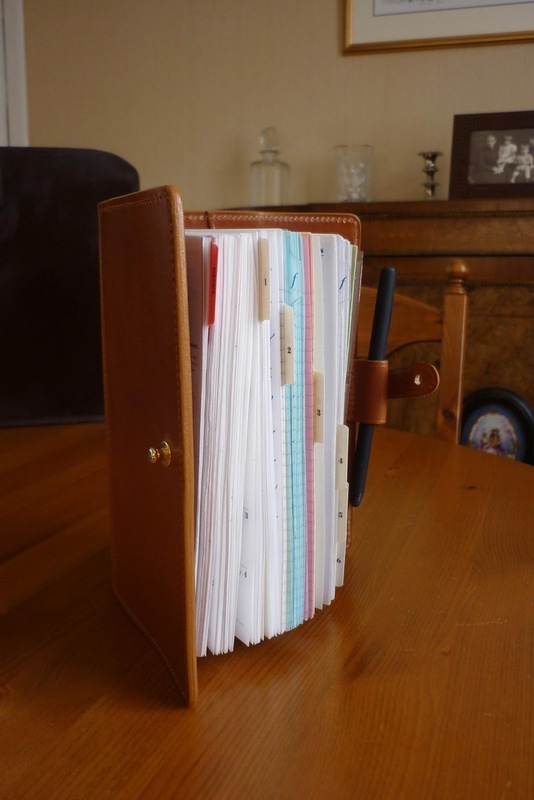 I have loved and valued my Filofax this year, and will continue to do in the next year. So the Mini is a grey one, so it nicely matches my A5 Malden's. In the picture above it is shown next to my black pocket Malden to give you some idea of the size. 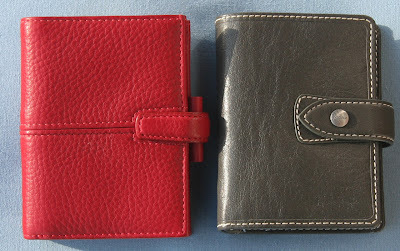 Comparing the two, you will see that the Pocket has a notepad slot in the right hand inside cover, were as the Mini has two more card slots. In the left hand side of the Pocket there is a zip pocket, with a slot behind it, a further slot pocket and another behind that. The last one being quite deep. In the Mini there is again a zip pocket with a pocket behind that and an additional slot pocket. 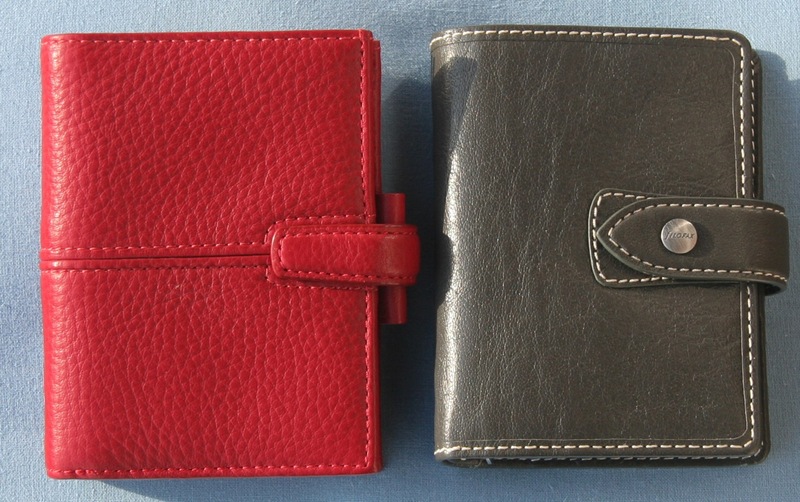 If you are going to use either of these sizes as a wallet/Filofax/notebook/shopping list type organiser then in some ways the Mini I think might work slightly better because of those slots in the right hand inside cover. Both have full width outside cover pockets, ideal for bank notes and receipts. In the pictures above is a Finchley Mini and the Malden Mini. 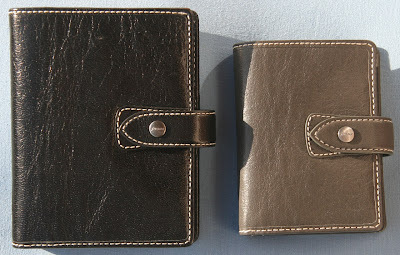 The Finchley has two slots in the left hand side and a large zip pocket in the right hand side. I use the zip pockets on any of these for a small amount of coins, but they can make the organiser quite heavy if you carry too many coins. 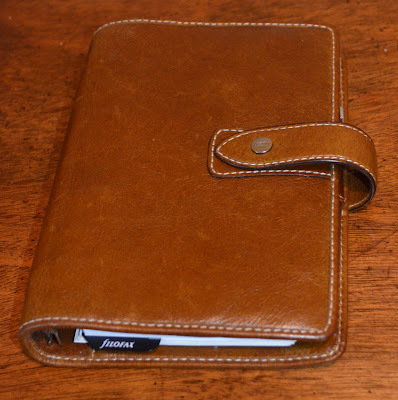 I have been trying out the Malden Mini as a wallet for the last couple of weeks, it works quite well. The only thing I've had to do compared to using the pocket size is to relocate my passport to my car documents wallet, which wasn't a big deal really. I also trimmed a health document I carry which stuck out the top a little, once trimmed down it slips in to the back pocket of the Mini just fine. I don't have that many pages in it, just a WO2P diary insert with some 2011 pages added, some lined paper and some to-do lists. I have bank cards in the front and medical ones in the back. So I think the Mini is a great addition. It also fits in to my pockets easily if I don't have my 'Man Bag' with me! Our dear friend Thomas has a Malden Mini which he has been successfully using as a wallet since the London Meet Up in March, he's made some top tab dividers for it too. Well, the passing comments on Philofaxy about GTD setups seem to have generated a great deal of interest, so I asked Steve if he would like me to come forward with some detail of my own....so here it is. Please be aware, though, that this is only ‘my’ setup – and, in fact, is only my setup at the moment – I can and do change setups quite regularly, as those who know me and/or follow my comments on the site will know! 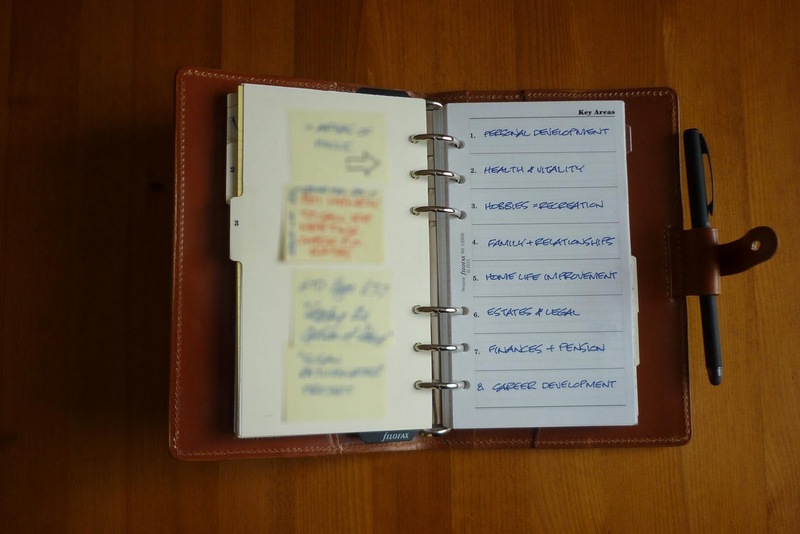 If anyone is interested in starting with the ‘received version’ of how to set up a paper planner for GTD, there is a very good white paper available from David Allen himself via his website. It’s a free download, although you have to register to get it, but that’s not likely to be a problem to anyone who has more than a passing interest in implementing GTD. And so, to my own set-up, which is really a modified form of GTD, both in setup and in underlying principle. I’ve made these changes because they suit me temperamentally, and I think we tend to underestimate the role of temperament in what will work best for us. 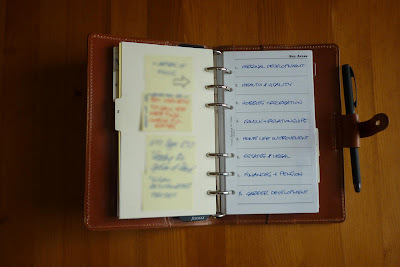 You, dear reader, may like a lot of structure (as I do), or you may prefer a freewheeling system which just captures everything you need to do and then leaves it to you to regularly review those tasks and make choices out of the whole range of available to-dos. That doesn’t work for me – I’m an accountant (CPA if you’re in the US) and time management consultant and have anything up to 120 ‘live’ deadlines for filing stuff with various Government agencies (or just delivering to the client) at any given moment, and each of those deadlines has sanctions, usually fines and penalties, attached, so it’s important that I keep on top of all of them, all the time. Firstly, my go-to binder. As regular readers will know, my first choice is a Personal Malden in Ochre. 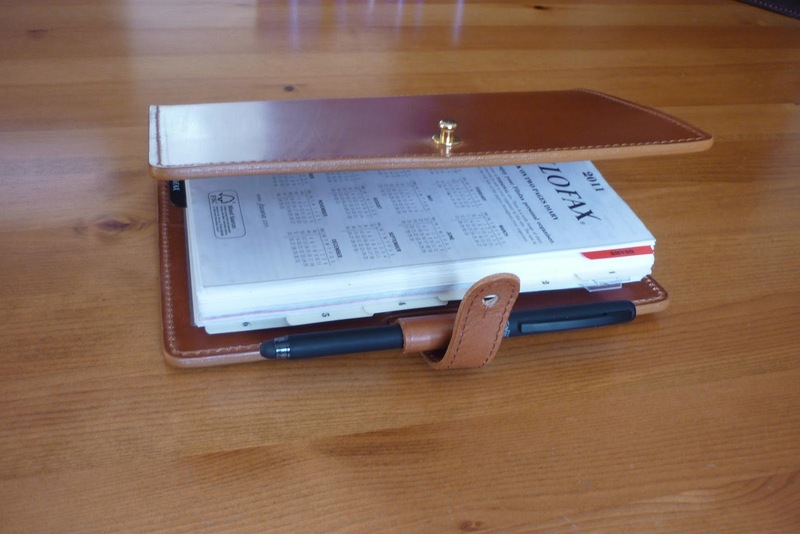 I love this binder, for the combination of weight, style and accessibility. I’ve tried using my A5 Finsbury, but it weighs enough to make it undesirable as a travelling companion, most especially when I’m in London on business, as I am quite often. I have enough papers, files and overnight stuff to carry without 6-8 pounds’ weight of organiser to add to the load. 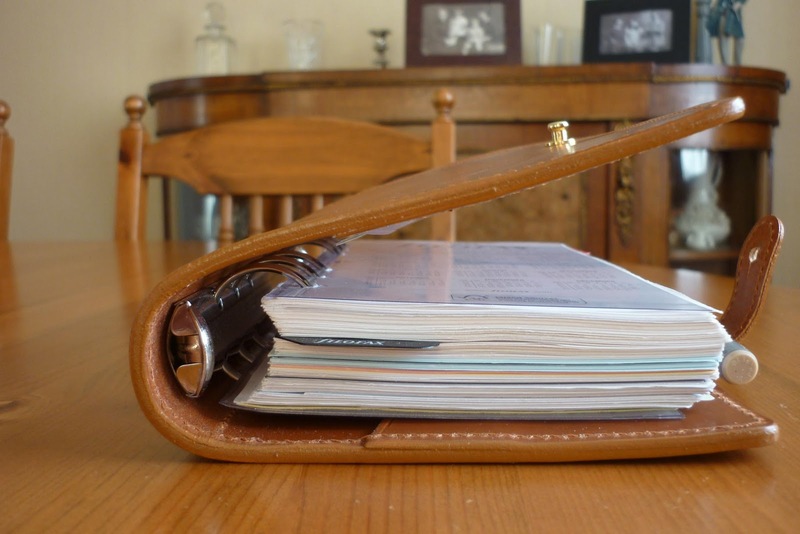 One of my underlying principles is, ‘One life, one organiser’, so I don’t split my stuff between binders, or use different binders for different aspects of my life. I want it ALL together in ONE place – which also happens to be one of the underlying principles of GTD. I know that when I pick up that binder I’m going to have everything I need, all together, in one place. Firstly, inside the front cover I have my most used plastic cards (the rest live in card-holder inserts at the back of the binder, plus my own business cards, plus postage stamps, train tickets if I’m travelling to/from London, etc. What I really like about the Malden (apart from everything else about it!) is the way the pockets are arranged here. This setup means that I can flip the binder open in the supermarket, at the cash machine, etc, and have all the plastic cards I need, right there. There is a larger pocket behind the card slots, and I use that to capture the receipts I’m picking up through the day as I move around. Because I’m self employed, I just capture everything, and then decide later, on a daily basis, what needs to be kept and what can be thrown. The ones I’m keeping them get entered into my accounting software and ‘cold filed’ away, again on a daily basis. If anyone who is self employed wants to know more about this they can get in touch and I’ll elaborate. Now into the main Filofax areas. 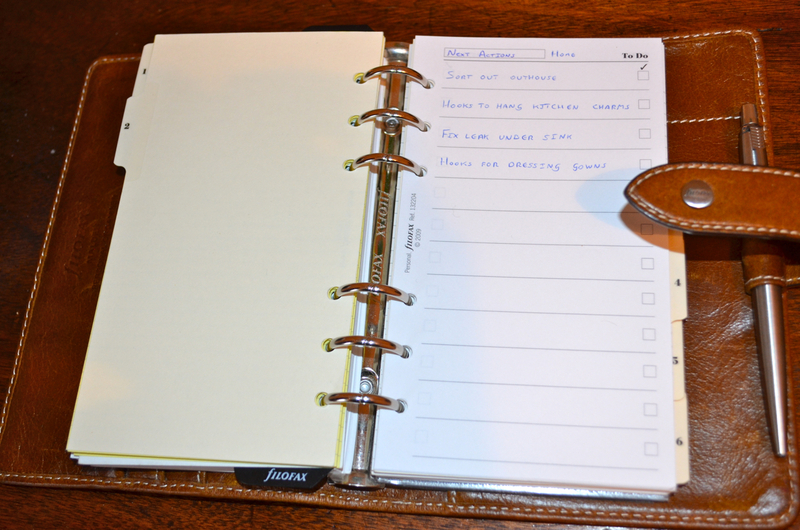 As you will see from the accompanying photos, at the moment I’m using a basic 1-6 divider set, but I’ve added the diary tab from a standard set of dividers at the front. I’ve cribbed this idea from Gerard (many thanks), and it works really well for me. This is my first real departure from the ‘received wisdom’ of GTD, which has the notes/capture section in first place – however, as I say, this work for me. 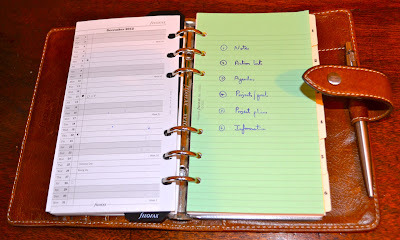 Diary-wise, my current plan for 2012 is to use a Day on 2 Pages diary/to do list setup, which I’ve bought from the French Filofax website, backed with a standard 2012 year planner. I can only get 3 months’ worth of daily sheets in the binder, but it’s a compromise I’m prepared to make. The year planner will give me perspective on the rest of the year (as well as on the 3 months I’ve got in as daily inserts), and pretty soon I plan to have a 2013 year planner as well, behind that, for anything truly long-term which needs noting. Generally the year planner only tells me geographically where I’m going to be at any given point – there isn’t much room for detail, but the place reminder is usually enough to prompt me. After the diary section, I’ve currently got a makeshift index page to the other six sections. I plan to replace this with a printed sheet pretty soon, once the whole thing has bedded in for 2012. Section 1 is my notes/capture section. This is my one concession to colour (once the index sheet has been replaced)....I’m currently using yellow lined here, it gives me the ‘feel’ of a yellow legal pad, which is what I used before I decided to unify everything into the Filofax. 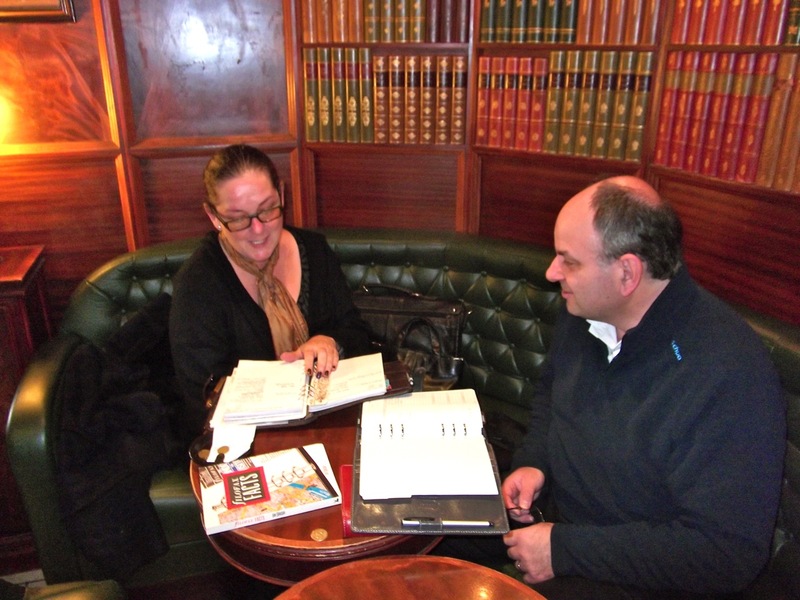 These notes are sorted daily, and the resulting next actions, projects, etc are transferred to the relevant sections. This is really the most important section I use daily.....the GTD ‘system’ of capturing everything in one place and sorting it later enables me to keep a clear head and to stay focused in a way which would be impossible otherwise. 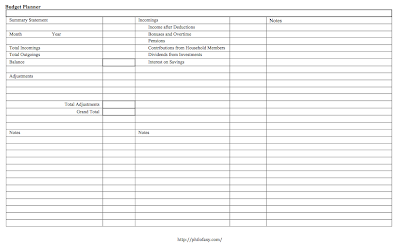 Section 2 is my Next Actions, divided into home, work, personal. If the ‘work’ list in particular starts to get out of hand I create separate lists for London (when I’m there, so this is in part an ‘errands’ list), phone, email, etc. I also have my ‘waiting for’ list in here, so that i can always be ahead of the game when it comes to keeping tabs on slow-responding clients. Section 3 is my Agendas section. I don’t use this a great deal (I no longer have that many face to face meetings, and I don’t have staff), but what do use it for is notes for my client meetings with those whom I see on a regular basis when I’m in London. That way I don’t forget anything I mean to raise when I’m in the meeting. 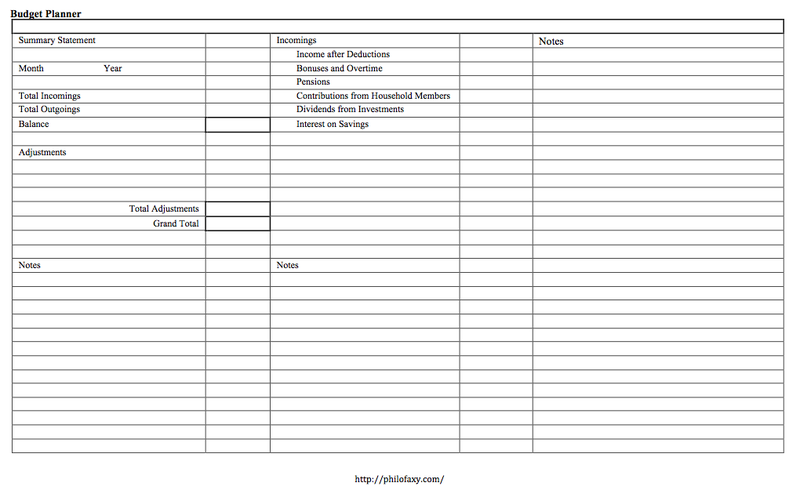 Section 4 is my Project Lists. 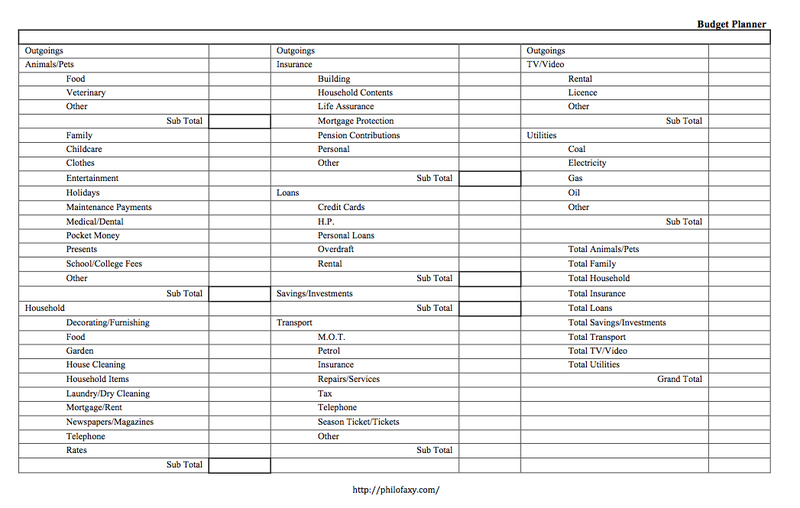 These are divided into work, home and personal. These, together with the Next Actions lists, form the core of my weekly review, which I try to carry out on a Friday afternoon, last thing, so that I can start the weekend knowing I have everything ‘nailed down’ for the coming week. I don’t like using my weekend time for this, even though some of it is personal stuff. As an adjunct to this, I also confirm any appointments for the following week, by email. Section 5 is my Project Plans section. I try to have a plan for everything which is in the Project List. Also in here are my 2012 goals, and a summary list of my Areas of Focus – again, all concepts taken from Getting Things Done and Making It All Work (which deals more with perspective than with just getting control). These also get reviewed in with the weekly review. I reckon I can do the weekly review adequately in around an hour....not much time invested, given the payoff. Finally, section 6 is my information section. In here I have various bits and pieces of often-accessed information. If I find I’m not accessing something on at least a monthly basis, it gets thrown, provided I have the information electronically somewhere, or I know how to find it easily. I don’t have a contacts section. All my contacts live on my mobile phone, and are far easier to access that way. Also, I have an Outlook-based address file as backup (which in turn gets backed up in my thrice-weekly overall data backup). I used to keep notes of my expenses in the ‘Financial’ tab of the standard dividers when I was using them, but since I dropped them (and the note-taking with it) I find that capturing the receipts and processing them into my accounting system (where they would end up anyway) is good enough. So that’s my system. You’ll see that I mostly use plain white ruled paper (or plain for printing) and I really don’t need a lot of different forms. Presently I’m using ‘To Do’ forms for Next Actions, but these could equally well be kept on plain white. I just happen to have them lying around so I’m using them. I think this entire system can be run using shop-bought plain white ruled paper, with some unlined for printing the odd sheet. 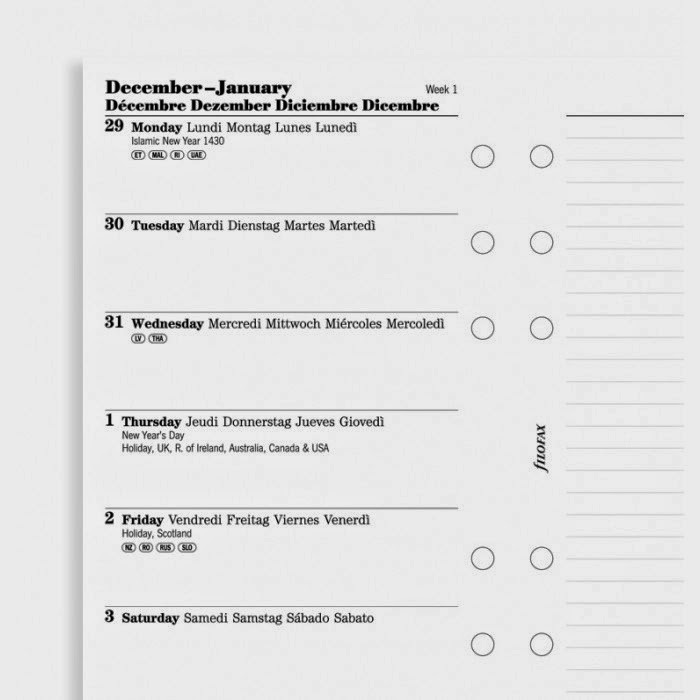 Good luck with your planning for 2012, and have fun! 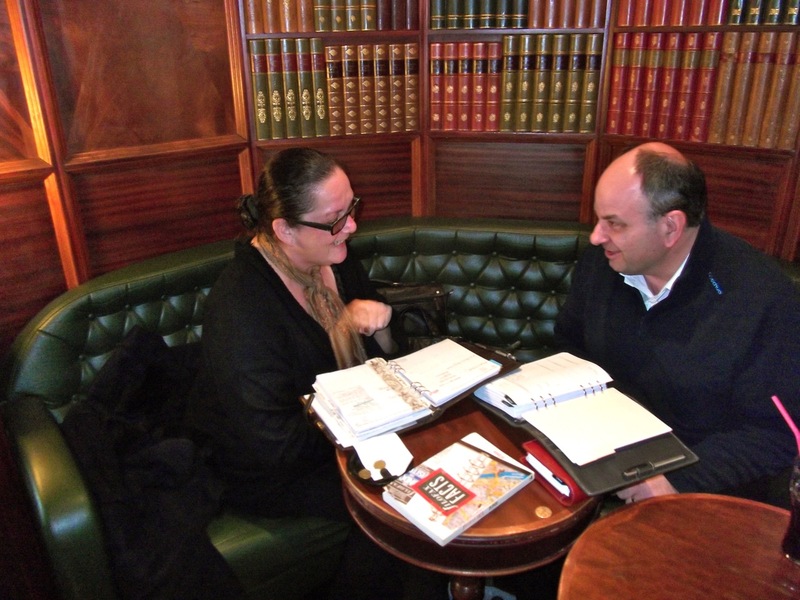 Thank you David for an excellent article and insight on your GTD set up. So you spent too much money on presents and booze for Christmas? 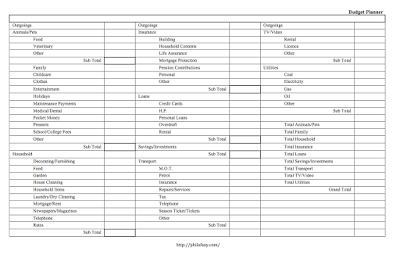 Time to start planning your budget for 2012? OK here is a template that will help you.. 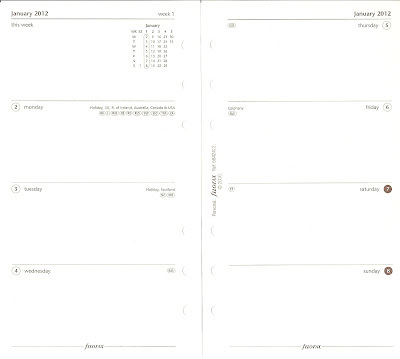 This template is designed for Personal size, but in a 'Z fold' configuration. To use this template you will need to cut a piece of paper to size (263 mm x 171 mm), then print one side, then the other on your printer. I used the manual feed on our laser printer and it worked just fine. Once you have printed both sides it just needs punching and then folding, at 95mm and then back again to the outer edge. Thank you to Gerard for sending me the original sample of this 'Vintage' Filofax page. Reader Question: Filofax paper, which pen? We have frequently seen comments about the (poor) quality of Filofax white paper, particularly how it doesn't like fountain pen ink. The Filofax cotton cream paper seems a lot better and higher quality. The later point is true, they don't do cotton cream in A5, shame really. So which gel pens and roller ball pens work with ordinary Filofax paper? And I suppose which ones fit the pen loop should also be taken in to consideration. As a supplementary question I was wondering what paper people use if they print their own inserts? 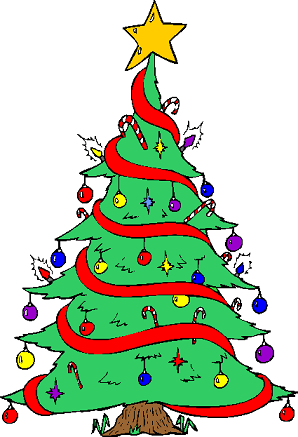 The Nan, Laurie and Steve would like to wish all our readers a very Happy Christmas. 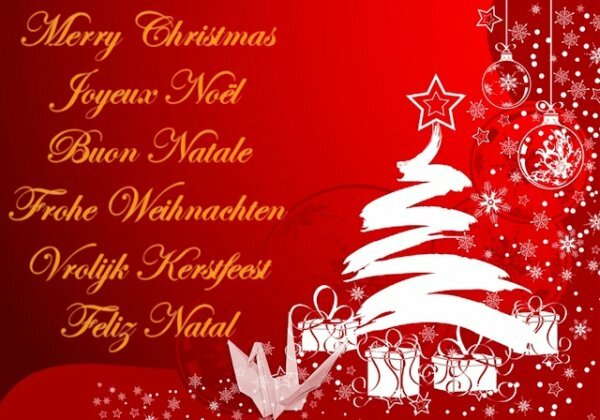 Thank you for all your kind support and participation in 2011, it has been quite a year for us all. Christmas Eve has arrived, the children are getting excited, so may be you need to hide away and have a quiet hour with a coffee and some web finds to read!! Leave a comment and mention you found the link to the post on Philofaxy... just in case they don't know about Philofaxy! As always on Fridays, feel free to discuss anything Filofax-related. All the routine posts on Tuesdays, Fridays and Saturdays are easy to do in advance, it's thinking through the ones on the other days of the week that needed thinking through a bit. So I was going a bit stir crazy with dates and posts and trying to slot them all in. During a break to wander around the supermarket to get bread and the usual stuff I thought... Blog-o-Fax, yes need one. Naturally I wanted to avoid buying anything new.. so I thought yes... my A4 Classic, it is sat in the cupboard just waiting to be used. 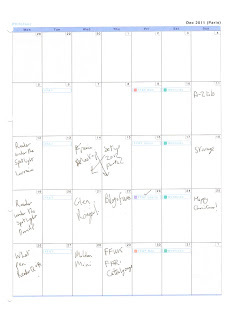 A4 would be easy to print a calendar off for and also it would give me plenty of space to write in the boxes, nice and clear and I will be able to see at a glance where I needed to write posts for. Yes I know the Classic is a bit of an overkill at £150... but I didn't pay that much for it when I bought it last year, and I have it sat in the cupboard. 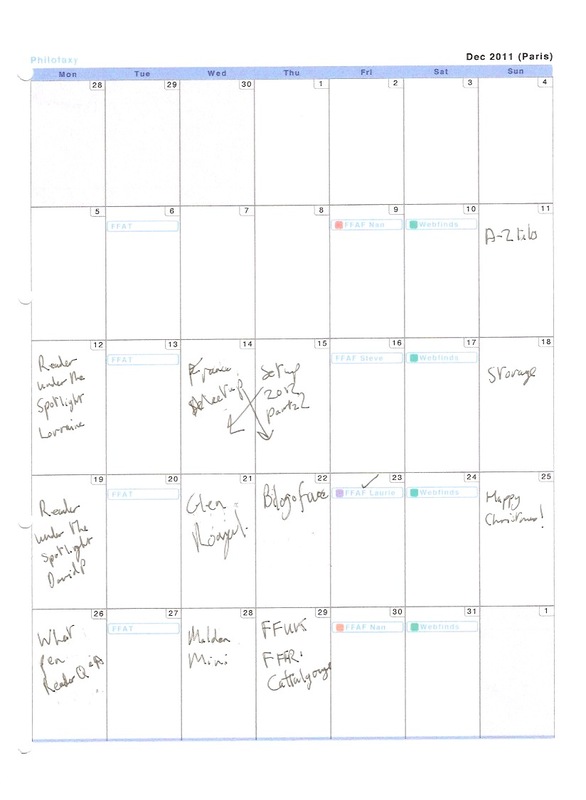 So I popped on to the computer and put in the dates of FFAT, FFAF (Tuesdays and Fridays) and then worked out a suitable layout and size etc. Printed off the calendar in colour as well! I took out some of the other pages in the A4 that I would no longer need, put them to one side and then concentrated on what I would need apart from a calendar. Some notepaper, and a couple of To Do list pages, can't do anything without a To Do list! 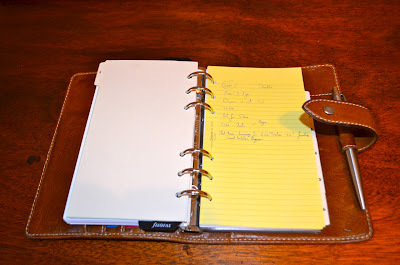 I've been using this for the last two or three weeks and it really has made a difference with my blog post planing. I can now easily see where the gaps are in the schedule, what is coming up, what I can shuffle when more time important posts come along. So the schedule does change and get updated quite often in a week. Once this next few weeks is out of the way, I might try transferring the idea in to my A5 desk Filofax, but it's been a useful exercise to try it out in a separate one first to see what I actually need over a few weeks before I make any changes to my main set up. A few weeks ago an on-line search turned up an organiser brand that was entirely new to me. Glenroyal are a small producer of bridle leather goods, all handmade in Scotland. In common with some other traditional firms, their website is not set up for on-line ordering, so at first I was a bit stumped. 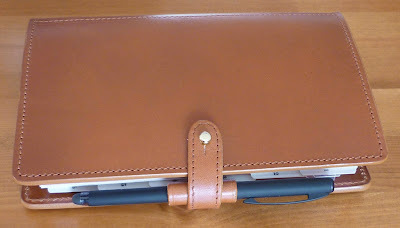 Anyway, this worked out well, since – instead of the usual impersonal on-screen checkout – I was able to exchange emails with a very friendly and knowledgeable lady, and quickly finalised an order for an organiser and a briefcase. As a small producer, they seemingly don’t carry stock, and the idea that my items were about to be made to order added another traditional dimension to things. A short while later I was notified of the tracking number, and the order was courier delivered to Dublin at a very reasonable cost. Each item was packed in its own green baize bag and wrapped in bubble wrap, all contained in a sturdy cardboard box. The entire process from order to delivery took just two weeks. So – what about the organiser itself? As I’m about to give it a rave review, I should declare up-front that I have no affiliation with the company, and that I paid full price for all of the items. I also didn’t know at the time that Steve would come looking for a review. 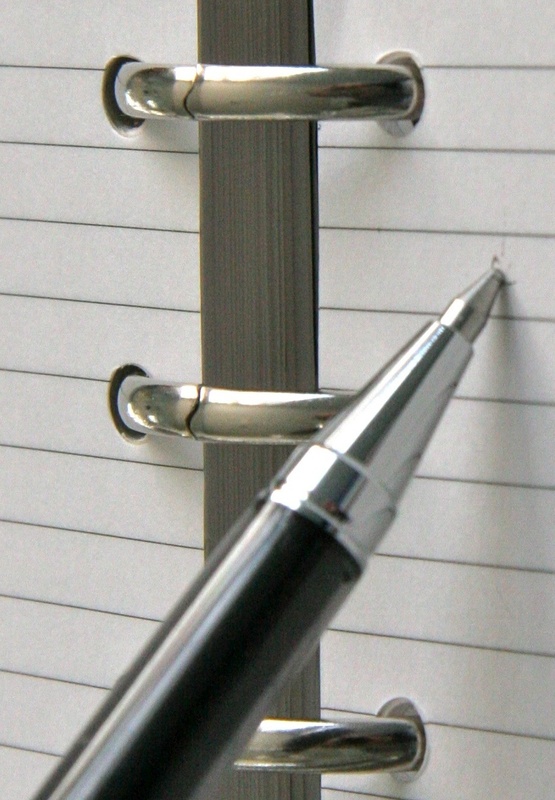 The binder is a standard six-ring arrangement in 23mm diameter and is compatible with Personal size paper. It came with a generic A – Z index tab set, but realistically I think anyone at this end of the market will have very specific refills in mind and the lack of any included fill won’t bother most readers. Incidentally, Glenroyal don’t manufacture any refills themselves. Currently, Glenroyal produce a single binder design, in standard Personal size. This is the antithesis of the Filofax approach, but – interestingly – it’s precisely the route that Mulberry have taken. The materials and workmanship are absolutely first class. The binder is made from thick bridle leather; the finish is impeccable and the stitching is 100% perfect to my eye. Being bridle leather, it comes with a generous application of dubbin to keep it soft and supple during transit and storage, and a thorough polishing with a soft cloth brought it up to a nice sheen. I opted for the “Dark London” colour, which is a classic rich chestnut tan colour. The edges have a neatly applied semi-matt finish which closely matches the main colour. The closure strap has a simple “Sam Brown” brass stud which works well and looks like it should last as long as any pop fastener. Similarly, the ring mechanism seems quite sturdy, with a good positive action and perfectly aligned rings. 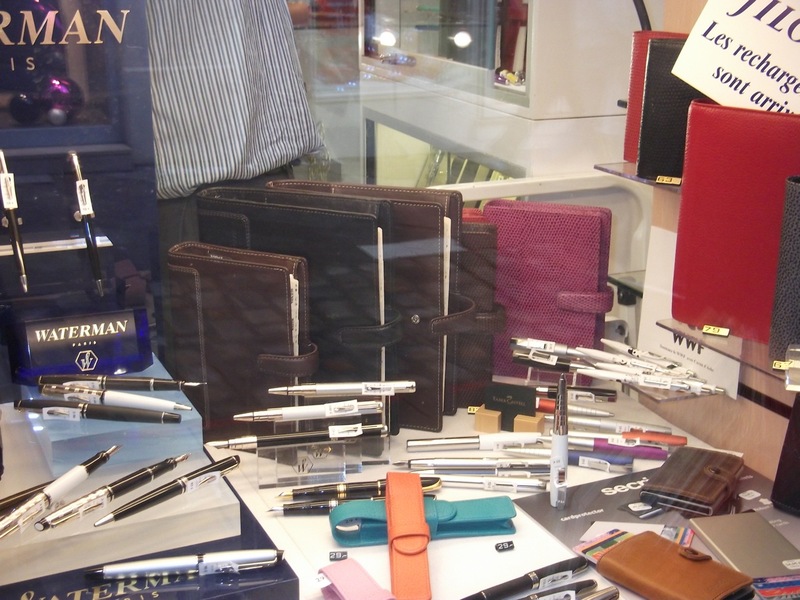 The binder has a single pen loop which is not elasticated, but is big enough to take reasonably thick pens. 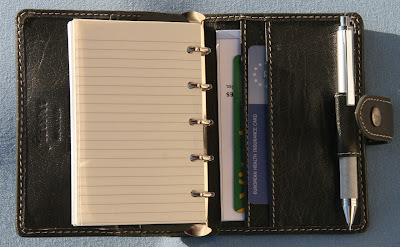 There’s a single curved full-length pocket back and front, which I find suits my usage very well, as I’ve always carried smaller cards in a punched holder and don’t use my organiser as a wallet. Overall, it’s a very understated design and the only sign of branding is a small logo and “Handmade in Scotland” text discretely embossed inside the front cover. 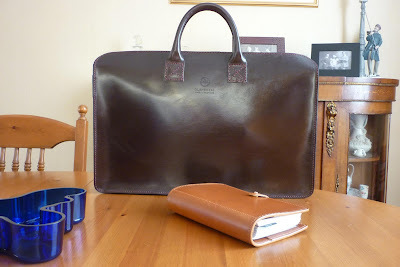 I’m delighted with the quality of the Glenroyal organiser – as I say the materials and workmanship are both first class. 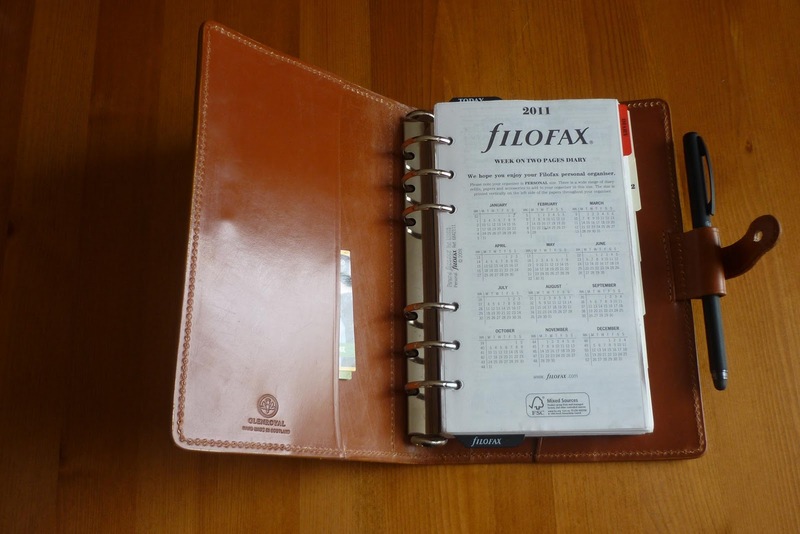 The cost of the organiser was less than the top-range Filofax binders, and it has a simple, timeless authenticity. 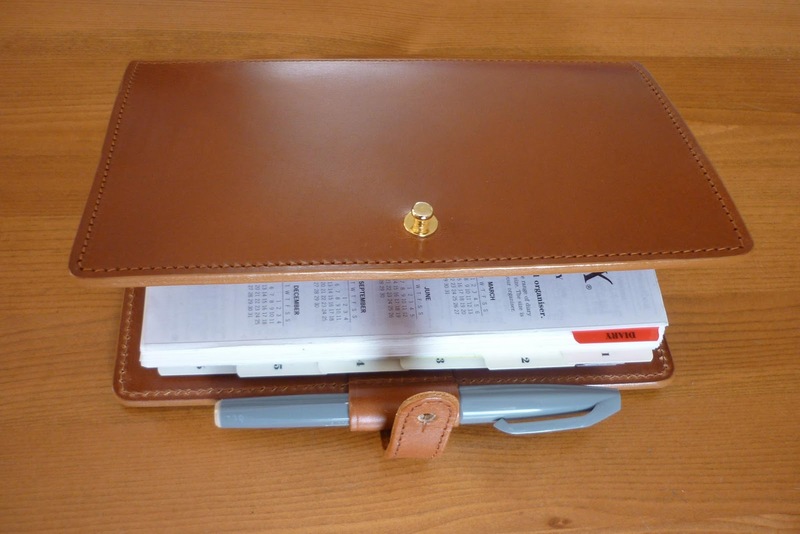 I’ve focussed here on the organiser, but I should mention that the briefcase is also a very fine piece of work. 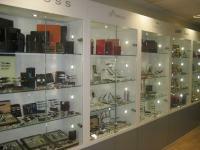 The buying experience was a pleasure, and I found the customer service and delivery arrangements excellent. 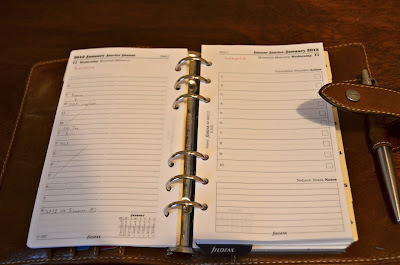 This organiser is perfect for my needs, and my only quibble has been the need to scale down from a large-capacity Winchester. Like most readers here, I’m certain to rotate between organisers over time, but I have a feeling that the Glenroyal will be at the heart of my collection for a very long time. Thank you Gerard for the review and all of the photographs, this organiser I think everyone will agree is a thing of beauty. Gerard in conjunction with Glenroyal has produced a leaflet giving the full details of the Glenroyal Personal Organiser, you might also like to look at their full range of leather products on their website. 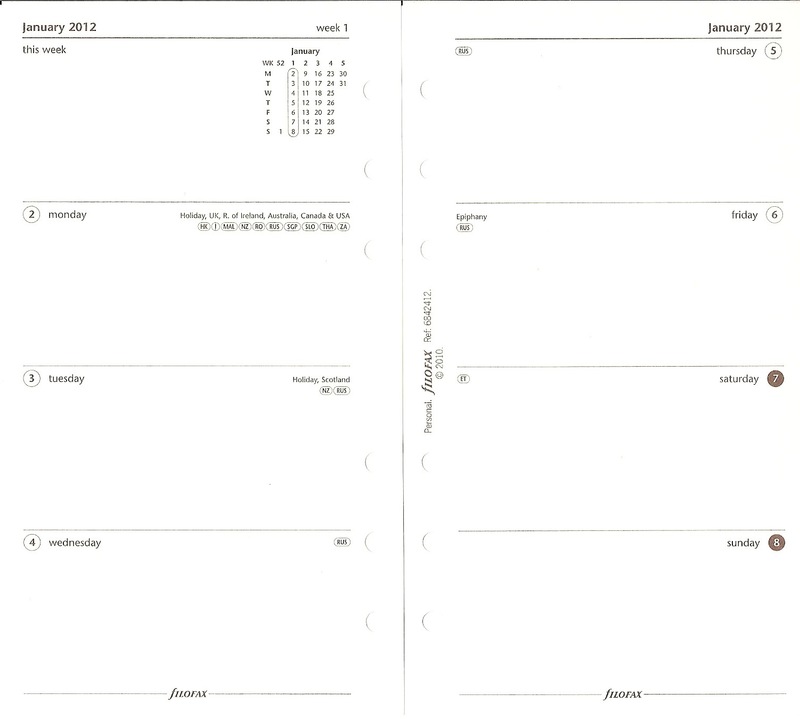 Christmas Filofax Questions? 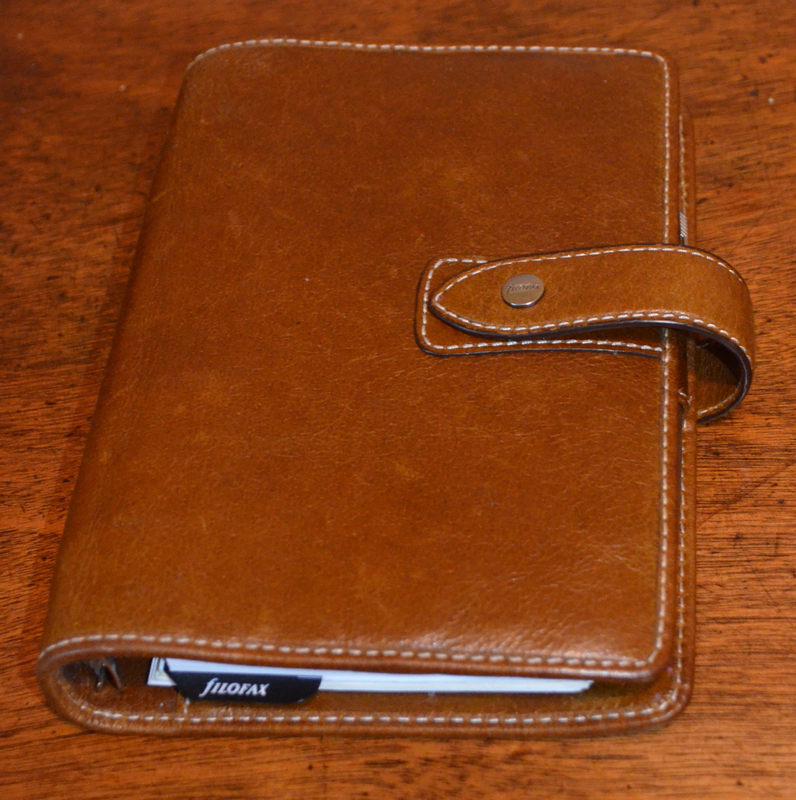 This is the place to ask them, or any other Filofax related questions. This week it is a great pleasure to introduce you to David. Hi, I’m David, and I’m an accountant in the UK. I’ve recently moved to beautiful South Wales, with my even-more-beautiful wife Emma, our three chickens and two lazy cats, Brue and Bramble (aka GrumpyCat). I was born and lived the first 50+ years of my life in London and only came to country living in the last six years or so. I love it! I’ve been interested in anything relating to time management for well over 30 years now, so it’s been a real joy to discover so many people with similar interests through the Philofaxy site, and I hope my profile will inspire one or two more to start using their organisers as a time and task *management* tool, and not *just* as a fashion accessory (although they are great-looking as well)! Probably around 1981. It was a very old duplex (two rings) version, but I have no idea of the model name. Maybe you can help! I used that duplex binder with a day-per-page diary on one side and all my to-do lists etc on the other, until I discovered and adopted the Time Manager system around 1982. I’ve always been an on-off Time Manager user, because I find the structure of the system suits me – it’s pretty rigid, and I like that. 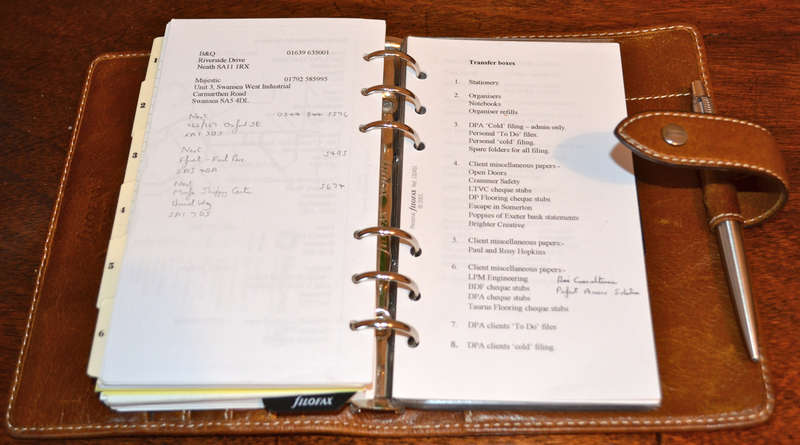 In between frequent bouts of TM usage, I’ve only ever been a Filofax user, and I’ve never *ever* been without a system of some kind since adopting that first Filofax back in the early 80s. Apart from my TM binder, three – a black leather A5 Finsbury (rarely used, although I *do* have the inserts for it), a brown oiled leather Hampstead which is now defunct in everyday terms (or maybe awaiting a new purpose) which I bought around 1998, and my personal Malden, which is my go-to organiser all the time I’m in Filofax mode. I use it for everything! It’s my diary, my task manager, my list-keeper, I keep my plastic cards in there, postage stamps, travel tickets when I’m away on business....there really isn’t anything I *don’t* use it for. At the moment I’m using the standard Filofax dividers (more on this below), although I do change to other sets, and back, quite often, so I have my diary in the front, my project and task lists under projects, my carry-around information under notes (which I also use as a quick-capture for anything incoming, using yellow paper to make it stand out from the white of the rest of the organiser), my petty cash records under financial (I’m self employed so I need to capture everything), and a few current contacts under contacts. I don’t fully utilise the contacts section, because I find my BlackBerry to be a far more efficient way of accessing and using contacts – if I’m away on business it’s usually to call or email, and I don’t need to look people up twice and manually enter the information. Definitely the flexibility. I reconfigure my system *often*, and now that I’ve had some practice, I can usually re-jig the whole system in 30 minutes or so if I have a clear idea of where I’m going. Binder-wise, I’m very happy with my Malden and I can’t really see how that could be improved, except by the addition of a second pen loop. I like to keep my diary in pencil (things change a lot and need adjusting), but I like a pen for other purposes. I’m still trying out the Frixion erasable pen, but my old-fashioned alter-ego would really much prefer pen and pencil separately. Insert-wise, I have some *serious* issues with Filofax. The FF paper is poor quality and for a fountain pen user that’s bad news in a major way. The bleed-through is terrible. If I were the designer, I’d take my Malden (with second pen loop) and fill it with good quality paper, a wider range of inserts, and a better choice of divider set-ups for different systems such as GTD. Frankly, though, I don’t think Filofax are invested at all in their inserts, and I think that’s a very bad business decision in the long term, as well as being really irritating to me in the short term. Almost always in my hand – I rarely carry a bag. If I’m away on business it lives int he front pocket of my briefcase, for which it could almost have been custom-designed. Otherwise, it’s in my hand whenever I’m out of the house, or on my desk (or the arm of my chair) when I’m at home. I like the Malden a *lot*, and I already own one, so I’m not about to go Filofax shopping. I’ve just bought some day on two pages diary inserts from the French website, so that’s enough shopping for me! Probably the Malden at £65 (I think) from Conduit Street. My Time Manager binder was around £200 though, and that was a few years ago. For design and functionality it was worth every penny. I love the community, and feel as if I have so many friends of a common mind here. I know that whatever my question, I can find someone who’s been there before and has ‘an’ (if not ‘the’) answer. Now I’m following some of the other blogs I’ve discovered through Philofaxy, that sense of a community of like-minded people is even greater. Really – there isn’t anything at all. My only dislike is that I sometimes can’t follow every comment to every post purely because of the volume of material. Probably Own The Night by Lady Antebellum. I have very wide-ranging tastes in music, so I generally use Spotify in my office, which is a great way to listen to music for a monthly subscription. CD-wise, I really can’t remember (probably Jazz, Blues and Moore by the Dudley Moore Trio), but as we’ve just bought a rather nice hi-spec CD player, I guess I’ll be back in the market soon! 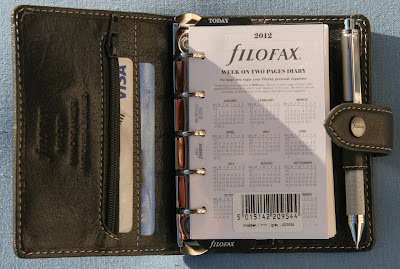 Reader Question - Filofax Storage? How do you store your unused pages or inserts? As the end of the year is approaching, how do you archive your past years diary/journals from your Filofax. 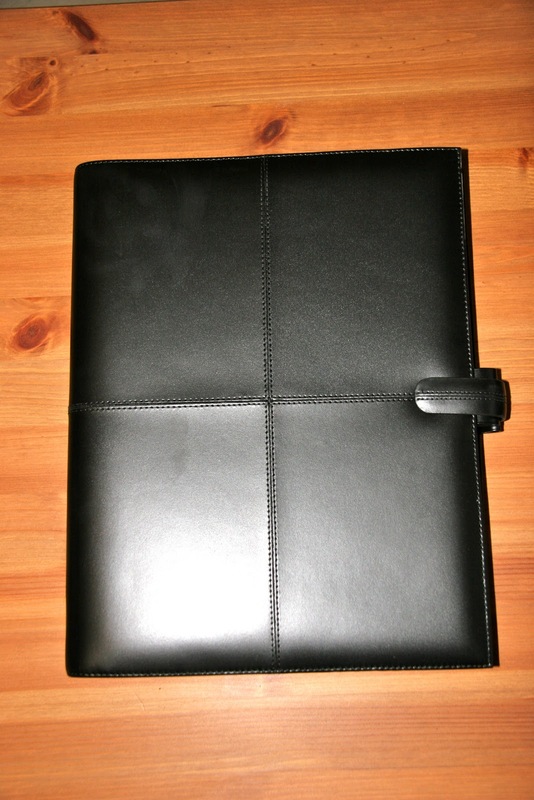 Does anyone have any different way of storing their 'spare' Filofax organisers? I know some of you will be dashing around the last full weekend before Christmas, but give yourself some 'me time' and take an hour out of your hectic schedule of shopping, partying, present wrapping to have a read of some of these great blog posts that have been sent in or I've found in this last week. And before you disappear... there are some great bargains on our Readers Ad spot page... keep a check on it. 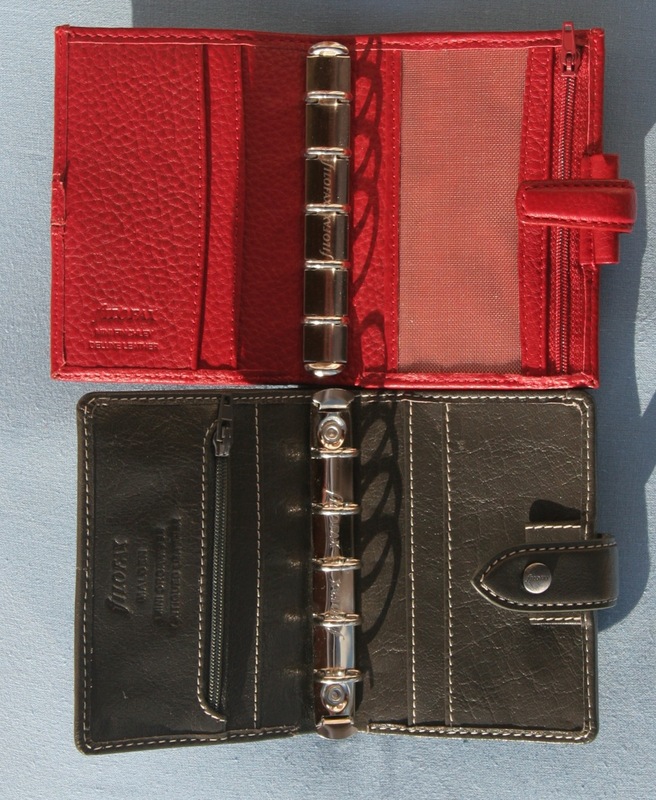 On offer today at Filofax UK is a the launch of 50% off sale on selected items. This offer is only for 24 hours until 10am tomorrow morning. Click on the Filofax Logo to the right to be taken to the site, all purchases via this link will earn commission which will be added to our charity donation total. 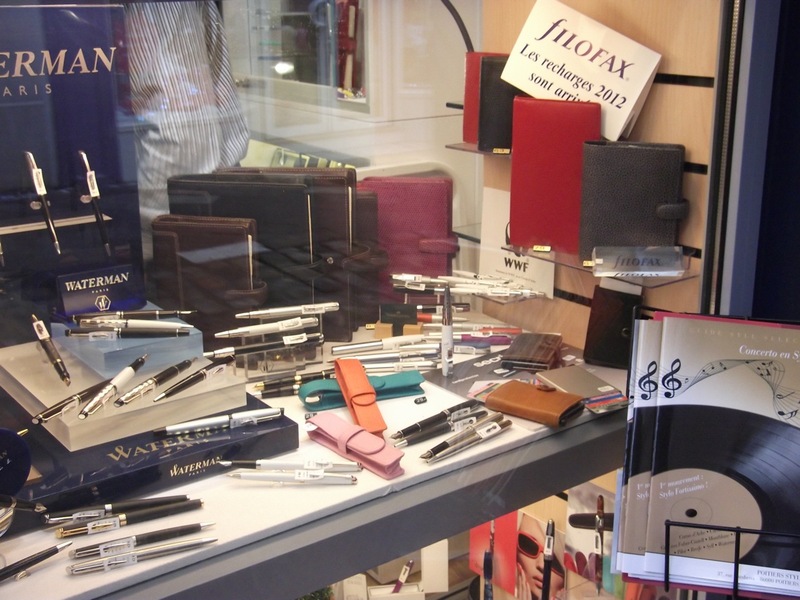 Filofax Germany are also having a sale at the moment, check out the details here. Just over a week to go to Christmas. I've found it quite hard this year to think of ideas for Christmas presents, fortunately we don't exchange presents with many people these days. 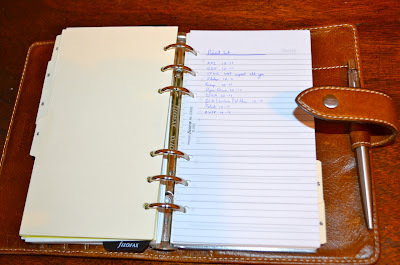 I think next year I will make a point of having a list in my Filofax to make a note of presents for Christmas and Birthdays throughout the year. Do you do anything similar? However, as it's Friday you are free to discuss anything Filofax related... have a great weekend. 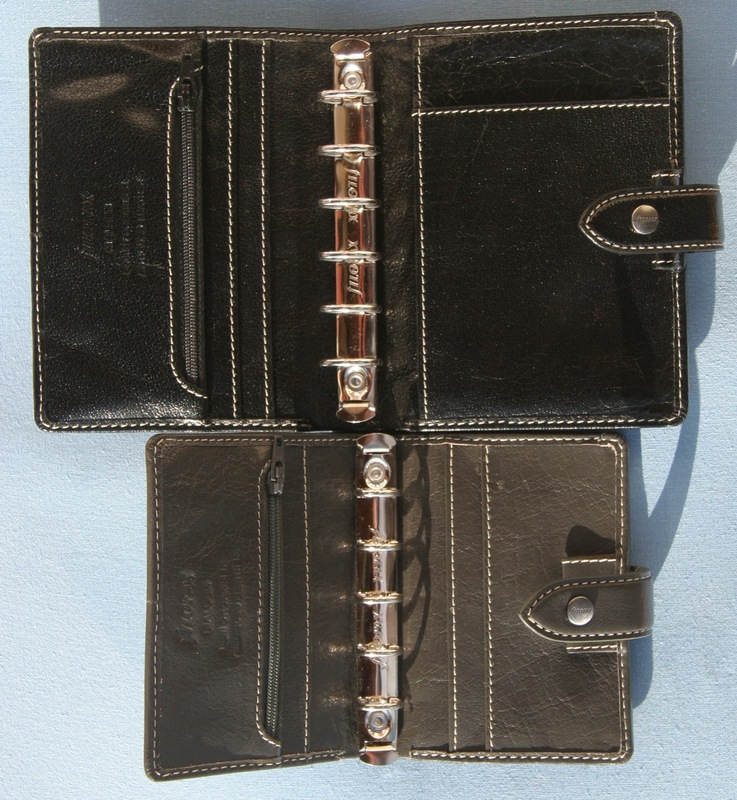 On offer today at Filofax UK is a 20% off Domino organisers (excluding gift set). This offer is only for 24 hours until 10am tomorrow morning. 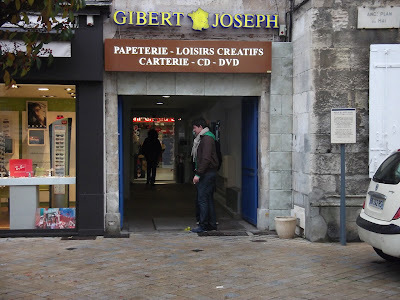 So it was a wet and windy on Tuesday morning, when headed down to Poitiers, which takes us about an hour on a good day. But with gusting wind and sweeping rain it took a little longer. All the effort was worth it. The sun did shine a few times during the day, and Nikki had a big smile on her face when she recognised 'Philofaxy Steve'!!! We had managed to arrange a mini meet up on a date when Nikki was going to be in Poitiers on business, so it all worked out very well. We met in Pub Le Gambetta, a small bar/cafe in Rue Gambetta. We had a long chat, poured over Filofaxes, had some food. Just like any other Philofaxy meet up, even if there was only three of us... Nikki, Alison (The hand of Philofaxy!) and Steve. This is just the stationary part of Gibert Joseph, that small entrance opens out in to an Aladdin's cave of stationary, Filofax, and planners and diaries of every size and make you can think of! 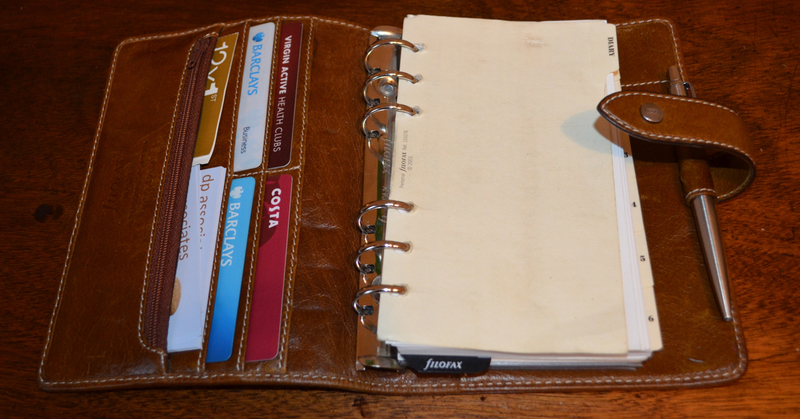 We kept finding more and more Filofax stuff tucked away on shelves in different parts of the shop! Their stock of inserts was very good. The range of organisers was a little limited but plentiful in numbers... no Apex's, oh how disappointed were we.. We both picked up Filofax France catalogues too... good bedtime reading! I will compare it to the UK one soon and do a post if I find any astounding differences. 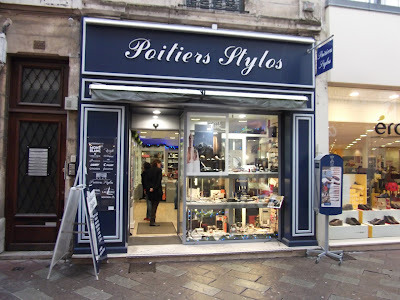 We then took a short walk up the road to Poitiers Stylos this is more of a pen shop than a stationary store, but they did have a very nice range of Filofax organisers on display behind glass, and in the window. With a stock of inserts just inside the door. Again not an Apex to be seen, we were shocked and disappointed! Thank you Nikki, it was great meeting up with you and hopefully we can have another meet up when the sun is shining in Spring/Summer and may be we will discover some more readers within reach of Poitiers. On offer today at Filofax UK is a Free UK delivery on everything for 24 hours. This offer is only for 24 hours until 10am tomorrow morning. You might recall last month I described to you my A5 Malden set up for 2012. Now I know a few of you don't like the size and bulk of the A5, especially if you need to carry your Filofax around with you each and every day. You will recall my set up in the A5 has two diary inserts in it... one for planning (present and future) and one for journal (essentially the past). 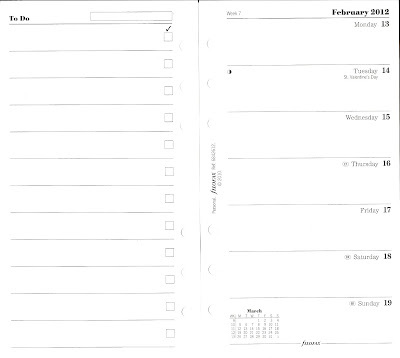 Another feature of the planning insert was the integration of the to-do lists in to the weekly view. So I did some catalogue studying and some web browsing to see if I could come up with a similar dual set up but in personal size. After looking around I came up with this solution. For journalling I would use the Week on Two Pages in English only, this one is in cotton cream paper. 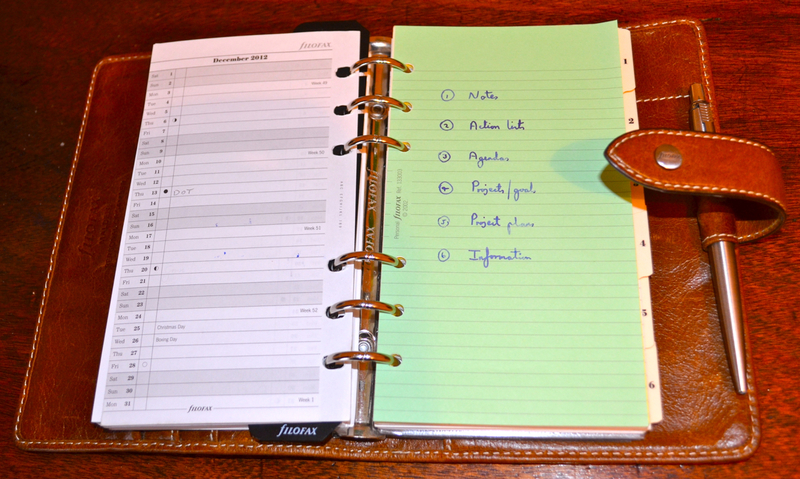 It retains the ideal situation of being able to view the days next to the tasks in the to do list. The next week the to do list swaps to the other side, but I don't think that's a major issue in terms of layout for me. 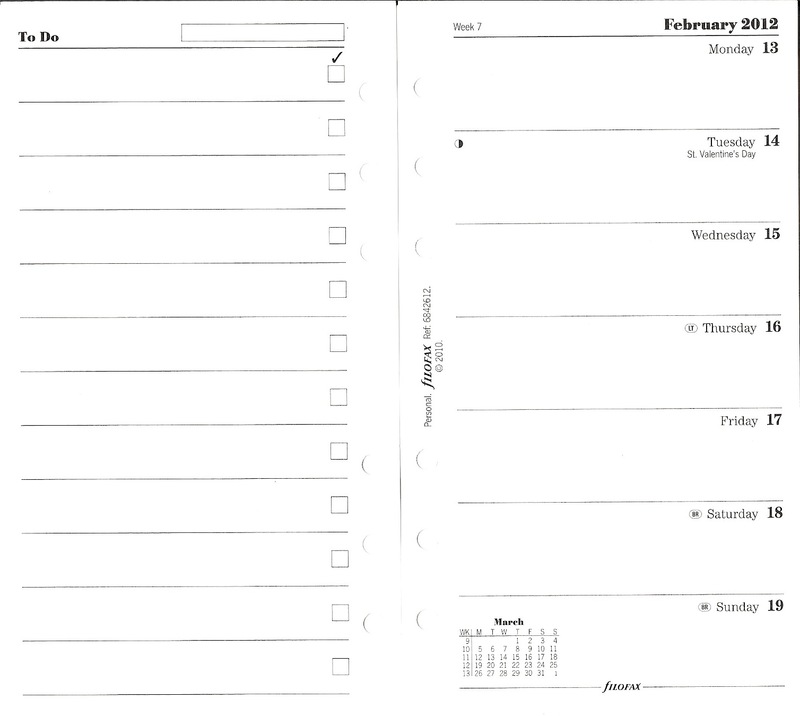 As an alternative there is the Week on One page with notes insert, whilst this maintains the same layout for each week, days on the left, notes on the right, it has the disadvantage of being multi language and the day spaces are already small enough as it is! The rest of my set up is pretty much as the set up I've been using this year in my Malden with addresses, information (maps), projects, notes etc. But slimmed down a little by removing spare pages so that the Malden can just about take the two diary inserts as well as the other pages. The best part of this set up is I can carry it anywhere, and at a push it could be my only Filofax, if I chose to go that route... as always though time will tell. I find I have to try out a different set up for a few weeks to know if it will work for me or not.